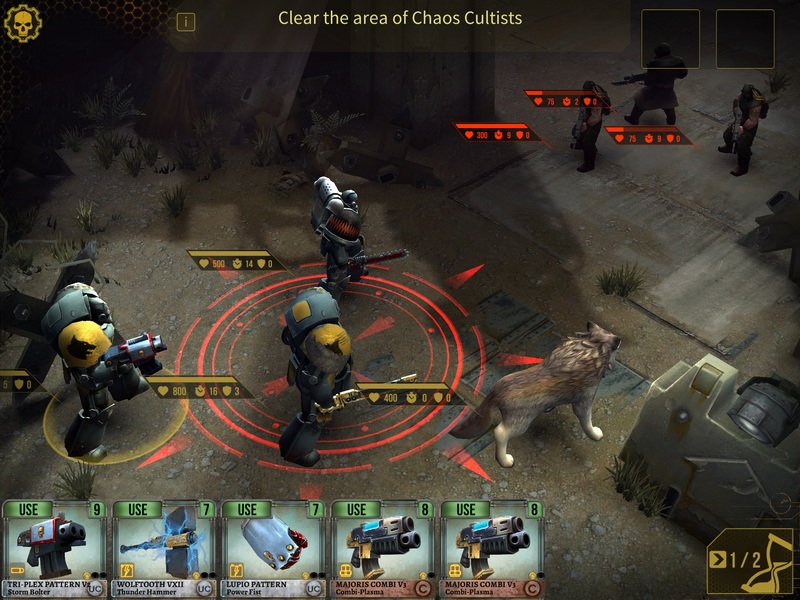 Veteran Developer Hero Craft is bringing the Sons of Russ straight to your face with WarHammer 40k: Space Wolf(Free). This visual stunner brings the table top classic to life in a squad based strategy card skirmish with the low low entry fee of nothing. If it sounds too good to be true, well there are some twists on the road to destroying the xeno threat. This game has some truly fantastic features intermingled with some pretty big roadblocks. If you can suspend your disbelief (and maybe an upturned wallet), you’ll find a pretty solid game here. Available exclusively for iPad 3 or higher, iPhone 5 or higher and requiring an internet connection, the game is a little less accessible than most universal apps. With gameplay very similar to the PSP’s Metal Gear Acid, I was really excited to get into what promised to be a tactically deep strategy game. Space Wolf is a turn based strategy deck builder. Each member of your squad has a separate deck of cards chock full of various gear and actions that can be utilized. You and your squadmates and your enemies take turns moving or attacking each other until you die or achieve the primary objective given to you at the start of the map. Each map has a new primary objective as well as secondary objectives that can end up being very rewarding. Each time a member of your squad takes a turn, they are dealt a hand of cards to choose actions from. As an advocate for the death of randomness, I don’t really mind the way the card draw aspect of the game works. In most rounds, you only get to play 2 cards, but about 90% of the weapon and gear cards have a dual purpose and can also function as movement cards too. Along with most cards having a dual purpose, there is a lot of tactical depth in the effort system. The effort stat on squad members and enemies is the way you can tell who is going to get the next turn. In between each turn, effort is always being decremented. Anyone that hits 0 is going to get the next turn. A big aoe flame attack might have 11 effort, while a move card might only cost 5 effort. 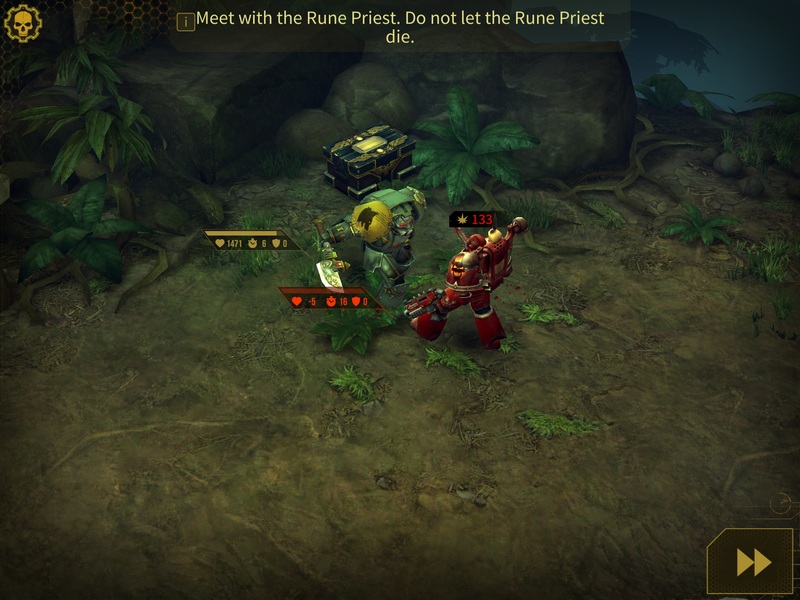 Queuing up your effort to maximize your damage before enemies can react is a huge part of being successful in this Warhammer title. Controls in this game are very responsive. The game camera is a nice piece of tech, allowing you to rotate at will whenever terrain is blocking line of sight to something. Controlling characters is a simple exercise that is streamlined and pretty tough to mess up. At 830mb on my harddrive, the game is not a light weight but within the realm of acceptibility for a full featured game with some pretty cool cinematics on top. Each weapon is thematically pretty true to the warhammer universe. Bolters are your standard ranged weapon. Plasma guns offer more firepower at the risk of a back fire. Melta guns pierce armor. Flame throwers deal aoe damage. In fact, the only thing I found standing in opposition to the established universe is the way drop pods are handled. 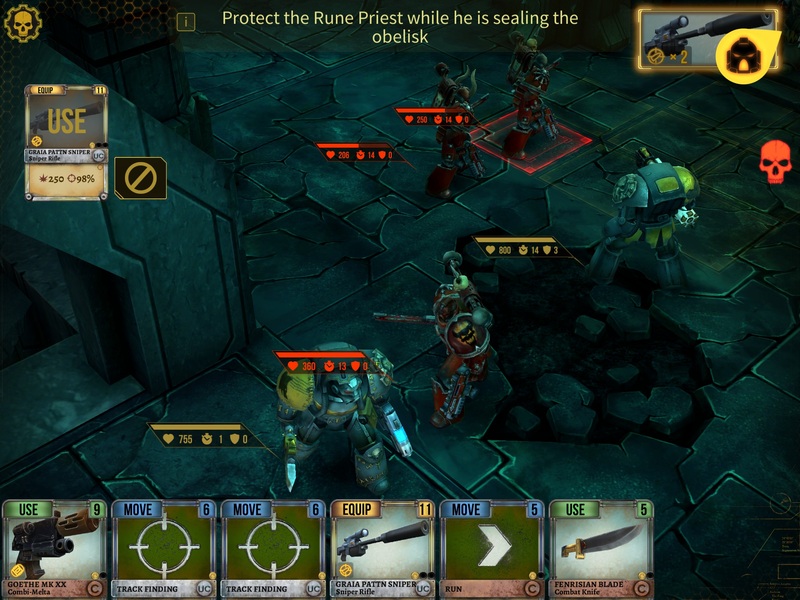 In the warhammer table top game, drop pods that carry troops into battle have a chance at landing off their target, and rarely result in enemy casualties. In Space Wolf, any person caught under a descending drop pod that I have seen has been killed, and I have never seen a pod scatter away from it’s initial drop location. It’s kind of a bummer when the drop pod landing reticle is occupying some prime real estate. The gameplay is, unfortunately, not without some weird issues. You aren’t able to attack to the side or behind without spending one of your two actions just to turn. You cannot walk through allies and can very often get blocked in behind your squadmates, but you can fire guns directly through them without harming them. Maps feel claustrophobic and limiting in some cases. Weapon ranges do not allow for much diagonal attack vectors. These issues, are relatively minor, however, and the majority of gameplay feels fun and satisfying. The game UI is functional and, while submenu navigation is a bit tedious, Hero Craft has promised to tighten up needless multi-tap actions. This right here is basically the turning point of the review. If we could have stopped here, I would be looking at a 4 star game, poised to shoot for that 5 with promised updates including multiplayer. We’ve already seen a few updates that show how well Hero Craft is able to tackle issues, even post release. The big issue is F2P. Your opinion on free to play is going to undoubtedly shade your opinion of Space Wolf as a whole. So I will give you guys a TL:DR version of the rest of this review. Hate F2P? Just change the rating at the top of this page to a 2/5 for yourself. Love or completely dont mind F2P at all? change that score to a 4/5. Personally, I dont mind F2P as long as it’s done intelligently. Below I detail some reasons why I think the IAP in this app could be handled better, not even cheaper, just better. Also if you managed to read this far, congrats, you get the magic ‘I read the review’ password: grognard. Just leave it in your comment and you’ll get super bonus points. They are worth alot… probably at least 3 macguffins worth. As a long time fan of Games Workshop intellectual property, I am well aware of the probability of having to pay to play. Any of their table top wargaming franchises are especially subject to this concept, but recent video game iterations seem to have bucked the trend. Sadly I don’t think I can say the same for Space Wolf. 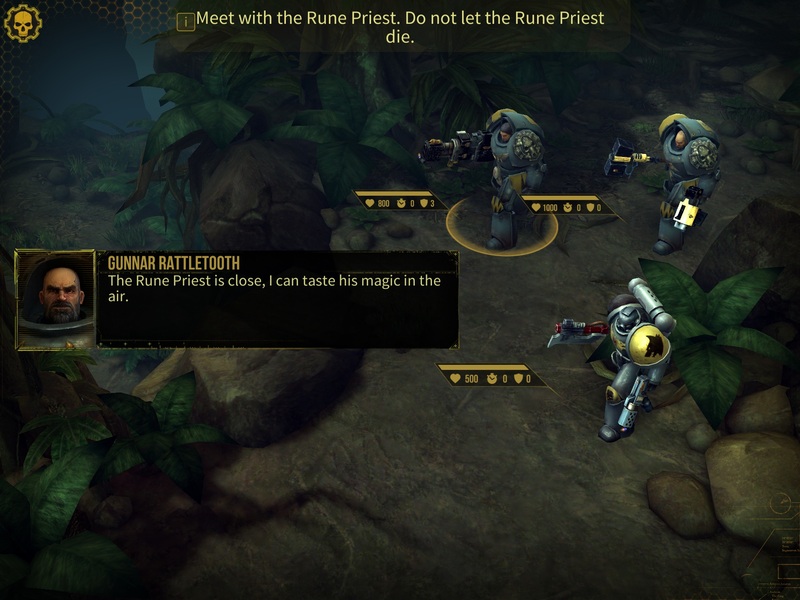 What I had expected and hoped for in Space Wolf was an experience similar to Warhammer Quest. In WQ, you can complete the entire base campaign without spending anything on IAP past the 4.99 initial price tag. Thats the big difference here though, with a free to play title, you are going to have to expect to pay a little more to see the same return that a premium title yields. It was with this in mind that I dropped $20 on the game to buy the wolf scout and terminator armor packs. I had just enough to level up a few times after the packs and I was back to being out of currency. So I headed back into the campaign to see how the terminator armor would handle. After getting into the 2nd chapter of the game, I am pretty well stuck. The 2nd mission of the 2nd chapter is pretty brutal. You and your squadmates are going to need to kill off at least 16 cultists and 9 drop pod chaos marines. 25 enemies is a bit much if you dont have a full deck of legendary and epic cards. So I am currently looking at a 4000 cost level upgrade that may or may not allow me to clear the level. At my current speed of play, thats probably about 10 hours or so. If I want to level up my squad mates? thats around 3-5 hours of grinding. Now I am not categorically against a grind like this, but I don’t know how much money or time you will need to invest just to finish the campaign. The game could do a much better job of at least setting the expectation that X time or Y money will allow you to set yourself up to conceivably clear each map. Right now its kind of like a juke box playing freebird that stops every few seconds and asks for another quarter, there’s just no way to quantify how much you will spend to get to the part that starts rockin. Ultimately, the game could really benefit from more defined purchase points. Many of the things that hold back WarHammer 40k: Space Wolf could be corrected with enough attention from Hero Craft. I don’t think that everything that could be improved on will be though. From a small dev team, we can hope to see big features like PVP and further adjustments to campaign difficulty, but I think there is more beyond just those things that will keep Hero Craft from pulling off a flawless game.